Do not damage the bushing on the inside of torque converter sleeve when removing torque converter. Remove converter housing oil seal using a suitable tool. Do not reuse converter housing oil seal. Apply CVT fluid to converter housing oil seal. 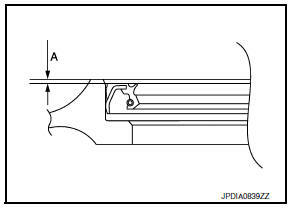 Drive converter housing oil seal evenly using a drift so that converter housing oil seal protrudes by the dimension (A) respectively. 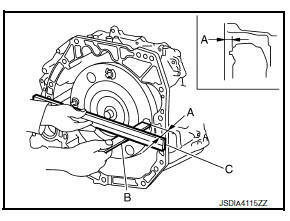 Attach the pawl (A) of the torque converter to the drive sprocket hole (B) on the transaxle assembly side. Rotate the torque converter for installing torque converter. Do not damage the bushing inside the torque converter sleeve when installing the converter housing oil seal. After inserting a torque converter to the CVT, check dimension (A) with in the reference value limit. Dimension (A) : Refer to TM-289, "Torque Converter".